The sunny skies, gentle breezes and lush greenery of the Cayman Islands provide both the stunning beauty and challenging features that make the three golf courses on Grand Cayman irresistible to golfers of all skill levels. The North Sound Club is Cayman's only 18-hole championship course. This par-71 course with greens built to USGA standards lies just off Seven Mile Beach beside the clear waters of the North Sound. 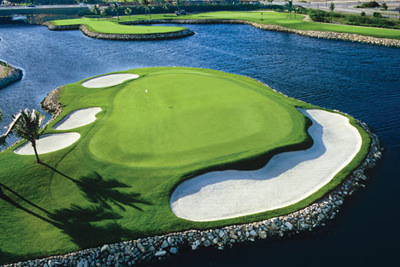 The Ritz-Carlton Resort is home to a beautifully maintained Greg Norman-designed course. 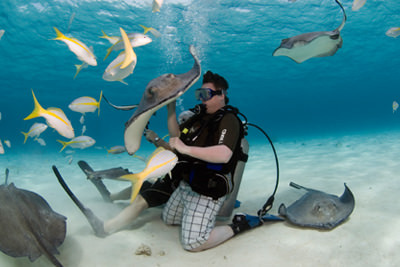 The Cayman Islands are recognized as the birthplace of recreational diving in the Caribbean and a Mecca of sorts to Scuba enthusiasts all over the world. At various times over the past 30 years, the Cayman Islands - either individually or collectively - have been named as the world's best Scuba destination. With more than 50 safe and reputable dive operations and 200 well-established dive sites marked with moorings, divers can choose from shallow shore dives to exciting deep wall excursions. Regardless of whether you're a novice or a seasoned expert, Cayman's warm calm waters, 100 foot-plus visibility, and breath-taking variety of marine life offer a world of exciting logbook entries. Each island offers very different diving adventures for divers of all levels - from the North Wall of Grand Cayman to the Caribbean's only diveable Russian shipwreck, the 330 foot M/V Captain Keith Tibbetts off Cayman Brac. Never been Scuba diving and want to learn? Most of the dive operations listed in the telephone directory offer short "resort" courses that will have you exploring the underwater world in no time. 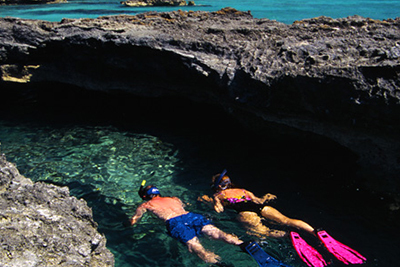 Cayman's calm, clear, current-free waters make snorkeling the quickest, easiest, and most-relaxing way to enjoy all that the sea has to offer. With little or no instruction and only the most basic of safety considerations, anyone from toddlers to great-grandparents can observe colorful tropical fish, centuries-old coral heads, shipwrecks, and other treasures from practically any point on the shoreline. 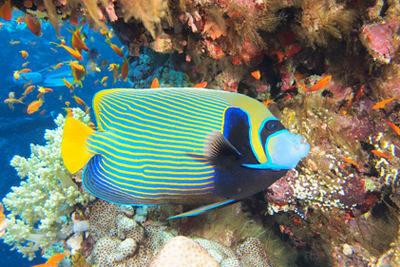 Simply don a mask, fins, and snorkel, enter the warm, inviting water, breathe easy and explore! Whether you prefer a conducted snorkeling excursion aboard a boat or just to venture out from shore, Cayman's greatest natural attractions should not be missed! To watersports enthusiasts the Caribbean Sea is one of the world's biggest and best playgrounds. Here, instead of sliding boards, jungle gyms and see-saws, kids and adults play on ocean kayaks, windsurfing boards, hobie cats, waverunners, aqua trikes, view boards, sun searcher floats, banana boats, paddle cats, paddleboats, parasails, water-skis and small sailboats. There's always a watersports center nearby that can advise and equip you for whatever you choose - so get splashing! The playground awaits! When Christopher Columbus first discovered the Cayman Islands just over 500 years ago in 1503, he named them "Las Tortugas," meaning "The Turtles." According to legend, there were so many turtles that the islands appeared to be covered with rocks. 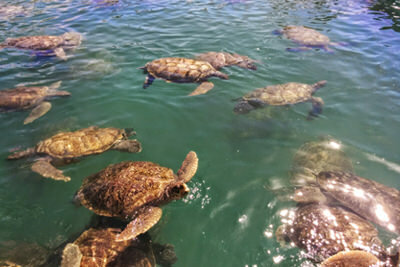 Today, the Cayman Turtle Farm, located near the North West Point of Grand Cayman, is home to more than 16,000 sea turtles, ranging in weight from 6 ounces to more than 600 pounds. You can visit the farm and interact with these marvelous creatures. Children love to pose for pictures holding the little hatchlings. In fact, since 1980, the Turtle Farm has released nearly 30,000 turtles back into the sea to help replenish the wild population. An average of 8,000 hatchlings are produced every year. Declared to be the "World's Best 12-Foot Dive," Grand Cayman's Stingray City has become one of the most popular tourism attractions in the Caribbean. Whether you remain in the boat that brought you to this unique spot in the North Sound or if you don scuba or snorkel gear, you"ll never forget the affectionate bond that develops between you and the dozens of stingrays who welcome you here. Not too far from Stingray City lies the Sandbar where you can stand in waist-deep crystal-clear water and hand feed the appreciative rays who range in size from one to six feet in "wing span." These tame, toothless denizens of the warm shallows of the North Sound like to swim with people, weaving their way around, between, over, and under their human counterparts. A trip to Stingray City and the Sandbar can be arranged through virtually any watersports operation anywhere on Grand Cayman. This is an opportunity that shouldn't be missed. 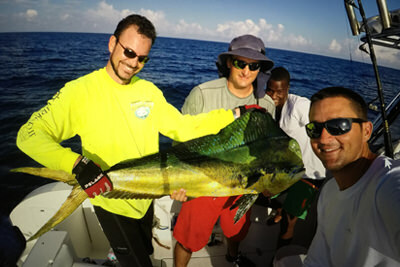 Because Grand Cayman''s average annual water temperature is 80 degrees, popular game fish such as blue marlin, yellowfin tuna, wahoo, dolphin (dorado), and barracuda are caught year-round. Local captains and fishing guides promote conservation and sportsmanship by encouraging anglers to release any fish which are not to be eaten and all billfish unless they are local records or potential prizewinners during tournaments. All three Cayman Islands have fleets of modern, well-equipped sportfishing boats available for full and half-day charters. 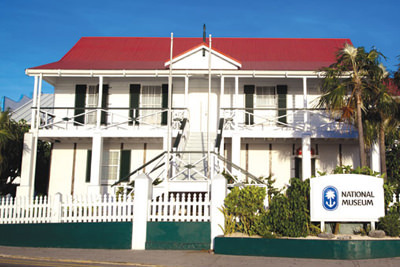 The Cayman Islands National Museum, located on the waterfront in the heart of George Town, offers some glimpses into Cayman's seagoing past and simple lifestyle. The museum itself occupies the restored Old Courts Building, one of Cayman's few remaining 19th-Century structures, a survivor of hurricanes and countless Nor'westers. During its history, it has served as a jail and courthouse - and a place of worship. It now contains more than 2,000 display items, from a 14-foot traditional handmade catboat to old coins, rare documents and natural history specimens. The Museum is open from 9:00am to 5:00pm, Monday through Friday and 10:00am to 4:00pm on Saturday. Her Majesty herself, Queen Elizabeth II, came to Grand Cayman in February 1994 and officially opened the Islands' crowning eco-tourism attraction. The Visitors Center is a contemporary interpretation of Colonial Caribbean and Caymanian architecture and color with wooden shuttered windows, wide verandah, and brick courtyard with waterfall. 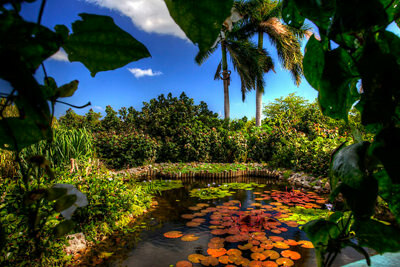 Nearby, the two-acre Heritage Garden recreates the Caymanian lifestyle of generations ago. Here you'll find a restored early 20th-Century, three-room, zinc-roofed wooden cottage featuring a porch, cook room with caboose, cistern, natural well, native coral stone fences, and pathways lined with conch shells. The surrounding two acres feature a colorful variety of blooming plants, including roses, orchids, hibiscus, and lilies; an area is dedicated to tea bushes and medicinal herbs, as well as a collection of traditional fruit trees, including mango, breadfruit, tamarind, plum, cherry, and vegetables, including sweet potatoes, yams, cassava, okra, peas, corn, plantains, and pumpkin. The Botanic Park provides a safe home for the endangered Grand Cayman Blue Iguana, allowing visitors an opportunity to see this nearly extinct creature in its own habitat. Located on Frank Sound Road in the District of North Side (about a 45-minute drive from George Town), the 65-acre Botanic Park is open daily. Experience 200 years of Cayman history in a 20-minute multimedia presentation at the Visitor's Center of the Pedro St. James Historic Site, the oldest known existing stone structure in the Cayman Islands. 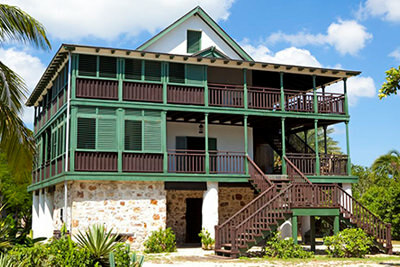 Built on quarried native rock around 1780 as a great house, Pedro St. James became the Islands' "birthplace of democracy" when a historic meeting of residents took place there in December of 1831 and resolved that representatives should be appointed from each of the Islands' five districts for the purpose of drafting local laws. Since then, Pedro St. James has survived hurricanes, a fire, and a variety of owners until a second fire in 1989 finally reduced the building to ruins. In 2001 the Government bought the 7.65 acre site to develop as Cayman's first national landmark and heritage tourism attraction. The new historically accurate restoration of Pedro St. James was completed in 1998. Every detail reflects authentic building techniques of early 19th Century Caribbean construction - from rough-hewn timber beams and wooden pegs to mahogany floors and staircases. The Visitors' Center includes five buildings in 19th-Century architectural style, surrounding a landscaped courtyard. Recent additions to the property include an early 20th-Century Cayman-style cottage and a 100-year-old wattle and daub home. Both were relocated to the site to enhance its educational heritage value. Other facilities include a resource center, gift shop, and caf. Interpretive displays and signs throughout the great house and grounds allow self-guided tours, although guides are also available. Pedro St. James is open daily. 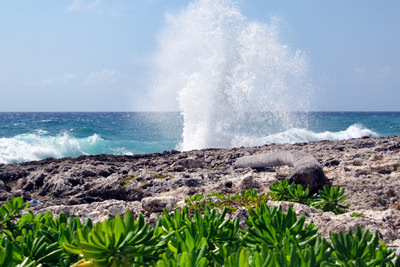 No exploration of Grand Cayman would be complete without a stop at the "blow holes" in the District of East End. This natural feature of the "ironshore," as it's called locally, offers photographers some of the Island's best pictures as water is forced through holes in the coral shoreline, rising geyser-like in spectacular fashion. You can walk out onto the craggy shoreline and stand right next to where the holes are a-blowin (but a dry towel is a suitable accessory). This is a cost-free attraction that is conveniently located on the scenic drive around Grand Cayman's coastal roadway. Folks who don't relish getting wet can still explore Cayman's world-renowned underwater beauty - from a submarine! In fact, The countless species of marine life, coral reefs, shipwrecks, and sheer drop-offs that attract Scuba divers from all over the world can be experienced and photographed by the entire family. Take a leisurely ride aboard the 48-passenger Atlantis XI submarine, or take the plunge onboard the Deep Explorer 1000 which accommodates two passengers on dives up to 1,000 feet. 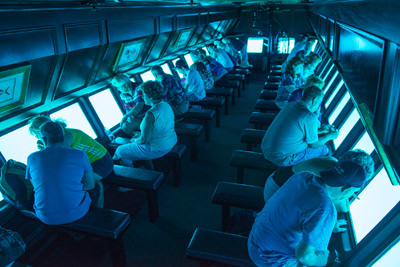 The Seaworld Explorer seats 35 passengers just five feet below the surface, while Cayman Submarines' SEAmobile descends with two passengers at a time to explore underwater life at depths of up to 60 feet with a 360-degree view. Nautilus operates a 60-passenger air-conditioned semi-submersible with a protected glass hull that cruises five feet below the sea's surface.